and EDW who have an extensive history of developing, implementing and supporting its 'best of breed' software solutions. In 2000, EDW Technology Limited began building a revolutionary new software platform to support the rigorous demands of the UK's deregulated electricity supply market – a market characterised by rapidly changing government regulation, business processes, market rules, dataflows and customer demands. EDW were founded as a provider of high quality, end-to-end IT services and we have remained true to that aim ever since, servicing a range of companies in the energy industry. For over 16 years, our software product ERS has empowered business electricity suppliers to transform customer experience, improve business efficiency, reduce costs to serve and improve profitability. EDW has a UK based team of 80 employees working from the EDW offices in Milton Keynes. EDW's customer partnership success includes the provision of IT solutions to an independent retail electricity supplier, who provided power to 120,000 MPANs run on the ERS software suite, and sold to a big six supplier for £62m. EDW is a dynamic company thriving on a diverse and energised company culture. Led by CEO Simon Miles, EDW continues to demonstrate its commitment to deliver software on-time and on-budget. Backed by a team with local market industry expertise, and the right AGILITY, ABILITY and ATTITUDE, EDW continues to deliver where its competitors can't. 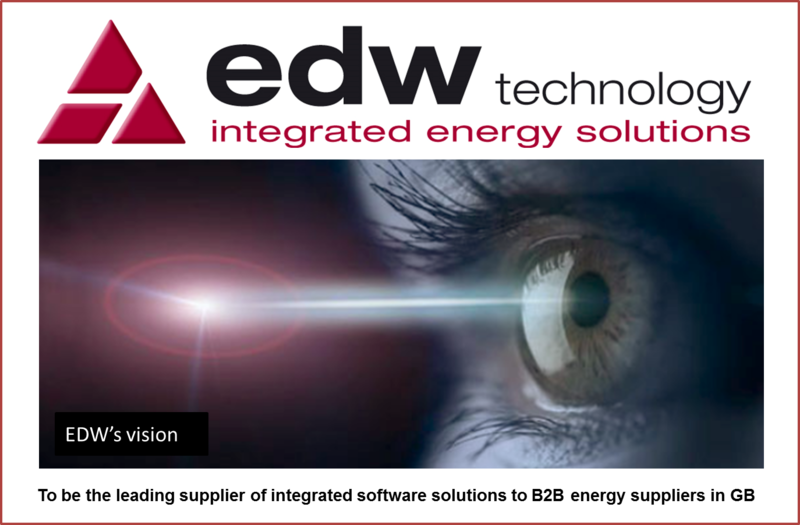 EDW has proven solutions to support B2B electricity suppliers in the UK market. EDW has worked with a number of industry participants. EDW has a reputation for deploying software that enables B2B electricity suppliers to effectively manage their meter-to-cash cycle, from processing large volumes of meter data and accurately billing SME and industrial/commercial customers, to delivering quality customer services and maximising revenue collections success. EDW also knows it’s not just about us. The success of a project depends on our ability to work effectively with your own resources, both to deliver results and to transfer key skills. EDW adopts an approach of open partnership. To get to know us call 08448 802 489.